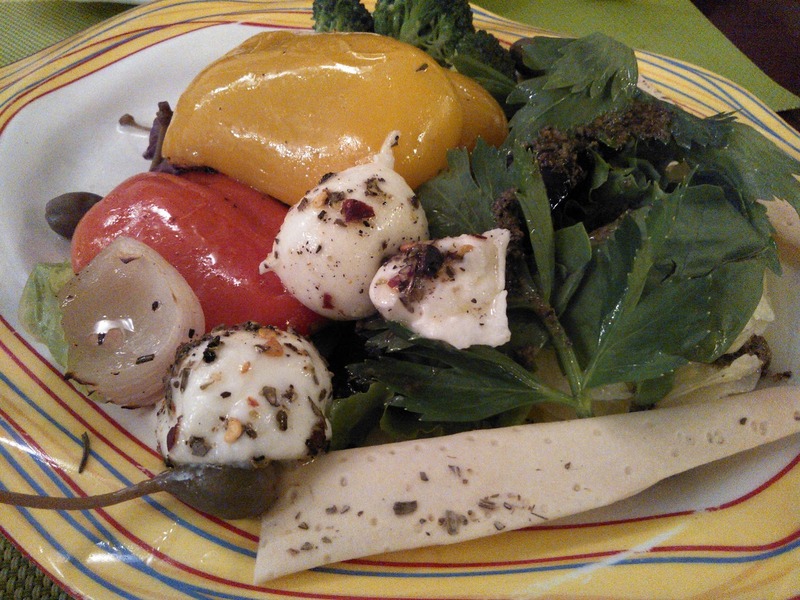 Okay, if you think that a salad does not qualify to be on a blog, then this post will disappoint you. If I have to write about Tuscana or Sandy's everytime we land there, the blog will probably have space only for those two restaurants. But then sometimes you come across something that makes you want to write about it. That day was one such experience because of the detox. A detox diet will warrant a special post by itself, but the lady of my home was going through a detox, wanted a salad, but did not want to eat the lettuce filled salad that most places serve and was eating my head instead to take her out to a nice place that will not upset her detox program and I had to keep hearing the phrase - "You are Chennai Foodie, find a place". Since eating head is also not part of the detox, we had to narrow down a place soon, so after talking to a few restaurants, we zeroed down to Tuscana. And that is why this post is special. While good food and good health go hand in hand, at times when the doctor prescribes a special diet, and in this case the doctor was yours truly, very few restaurants can make the effort to make it for you but even fewer have something one the menu that is so good that the person does not mind the diet restrictions! In this case, during this phase of the detox, she was allowed to eat all vegetables except potatoes, all fruits, chicken breast, fish, milk products like cheese, buttermilk and egg whites! Yes, this is not some gimmick liquid diet detox, but a structured one that makes you eat good food. She asked for a Insalata di Verdure dell'Orto salad (no way I could remember that name, so I copied it from the online menu) and thought we will ask for a chicken breast based main course later (I had the Parmigiana Chicken in mind, slurp slurp), while I settled for my favourite pizza at Tuscana - The Ruspante. I like the pizza because it is simple, has a reasonable amount of meat, sun dried tomatoes and broccoli and some bell peppers too! Since we landed there by about 1045 in the night, they ran out of the complimentary salad that they usually offer and one that I love too and so I was a little sad. But the salad came and made the wife so happy that I was relieved. There was not a single lettuce in it, but it had grilled aubergines, zucchini, bell peppers and tomatoes with cape berries, fresh herbs and feta cheese with balsamic dressing. Yes, it is not the best food in the world, but for a salad it was amazing. More importantly, it gave the detoxing person a much tastier meal compared to the salads at Subway and Quiznos and BBQ chicken and the likes which are full of lettuce. She was filled enough to not order a main course. 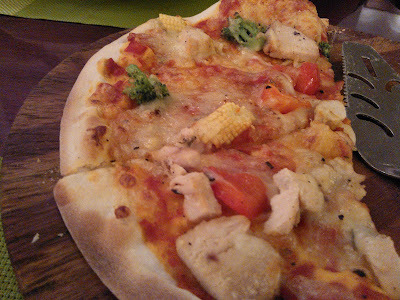 My pizza was light and super tasty and the best part of eating a meal at Tuscana is I feel full, but not stuffed. Yeah, I try to practice what I preach and places like this help!!!! Obviously, I had to eat the whole pizza as pizza base is not part of the detox diet. We did not need the main course, but since the meal was rather incomplete, I want to get back and eat the 'Hay and Straw' Pasta and the Chicken Parmigiana. I hope those are still there on the menu, cos this place changes menu too often for my liking! As usual the experience here was a 4/5. If I got the starter plate, I might have given it another .25 stars!!! I love another thing about Tuscana - the price you see on the menu is the price you pay. What you see includes service charge, service tax, money paid to the chef, money paid off to any local goonda who comes, rent, profit etc etc. Atleast that is how it usually is, but that day it was different. When I presented my credit card, the waiter came back and said "Sir, there is a 15% discount for this card, I will charge for 15% less and bring you the new bill". Tuscana Pizzeria is located at Wallace Gardens, between Khader Nawaz Khan Road and the Wallace Garden Road that hosts Subway! And hey, if you enjoyed reading this, please share!